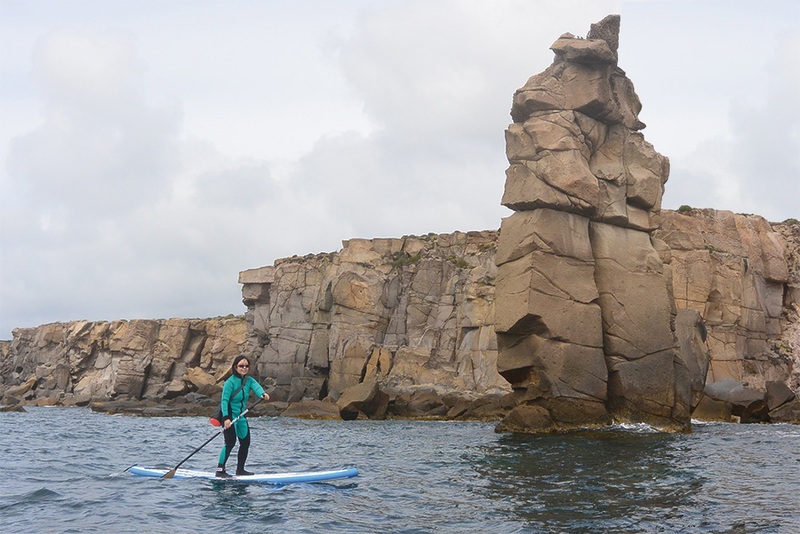 Diana and Mario from SUP Adventures came to see us in October 2014 to see if we would like to collaborate on some trips to San Pietro, their small island 7km off the SW coast of Sardinia. They had established a successful school there 6six months earlier and were ready to expand beyond the busy summer season. A trip to check out the island confirmed that working together made good sense. San Pietro has 18km of coast and is just 51 square km in size. The summer is hot and busy with mainly Italian and German tourists, but that’s just July – September. From April to June and from October to late November are the best months for SUP with moderate temperatures (average around 14-20c). The coastline has contrasting high cliffs, sea columns (stacks) and sea caves in the north and west, with sheltered beaches in the east and south. Because the island is small enough to drive across in minutes, it’s easy enough to avoid wind and find shelter from swell. Conditions are often perfect for 5km + downwind paddles. There’s no big groundswell waves like north Cornwall and Devon but you’ll often find smaller, wind driven swell that can be ideal for learning SUP surf. My first paddle there was in early December 2014, when the north of the island was sheltered from strong SW winds. Mario showed me the many sea caves along the volcanic rocks and high cliffs of the north coast. We had almost flat calm for our 6km trek along the north and then, as we turned around the NW tip of the island and gradually lost our shelter, the swell started. For over an hour we battled a strong headwind with a swell of one metre, gradually increasing to two metres. Mario grew up on the island and knows the coast very well so we had plenty of options to turn back or turn into a sheltered cove. We pressed on to keep to plan and after 4.5 hours of paddling we arrived a little later than expected but with enough reserve energy for a downwind paddle next day. The sea was still warm enough to paddle in a light thermal top and shorts without ever feeling cold. 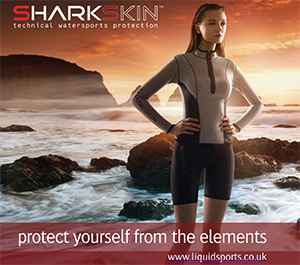 Back home in December we were starting to consider gloves, coats and even wetsuits for much shorter trips. The sea caves were really interesting to explore. Some have huge cathedral-like opening chambers with smaller passages leading off. Without torches and helmets we mostly stayed in the larger chambers but taking basic equipment would be worthwhile. 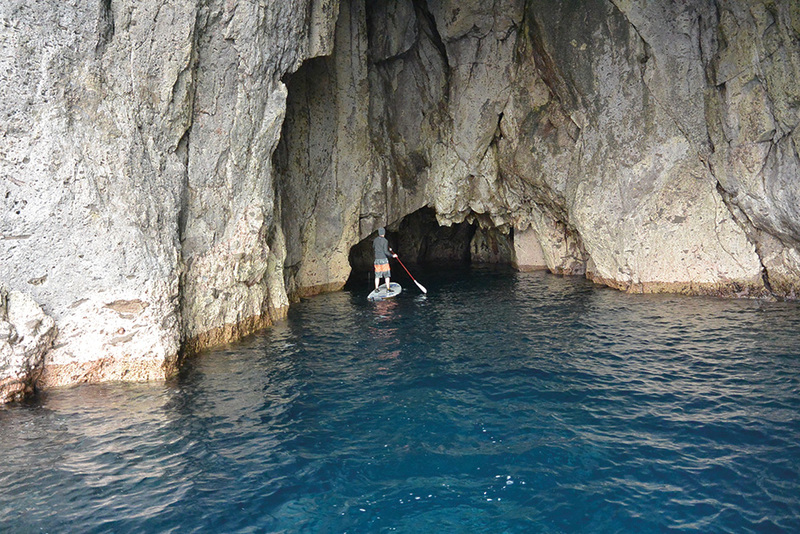 SUPs are actually better than sea kayaks for exploring caves as they are shorter and more manoeuvrable – also you have the option of prone paddling to get through the lowest passages. Shafts of light entered some caves through the rocks above, lighting up the aqua blue water. Very few of the caves can be reached from land so they are virtually unexplored. While the northern coast is characterised by caves, the southern coast has wonderful white sand beaches, with a changing volcanic coast with red mud stones and ochre. There’s also the symbol of San Pietro’s Island, The Column, a sea stack near the cliffs to which you can paddle close when the swell allows. After experiencing the potential of the island, I was keen to arrange a first trip there the following Easter. This was a collaboration with Jen from Pureyogazone, which meant we could also offer SUP Yoga. 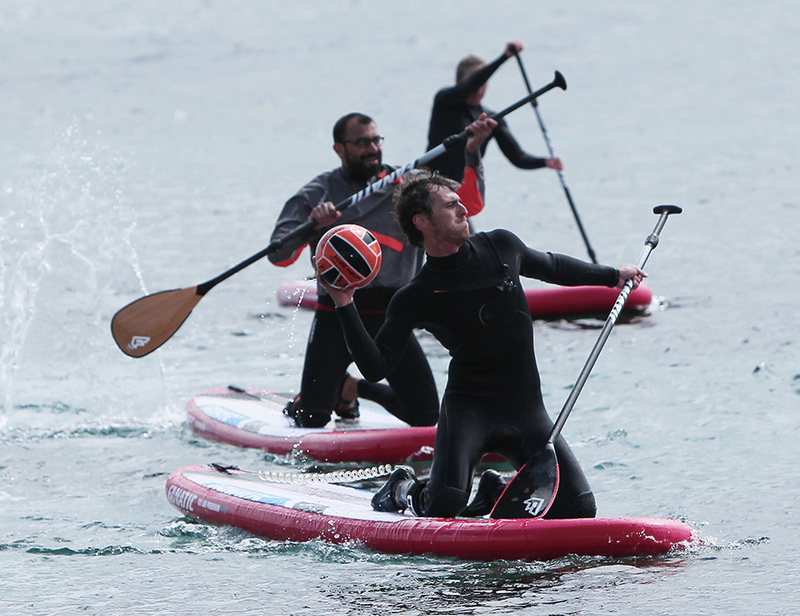 Adam, our SUPBall http://www.supball.co.uk expert, joined us to arrange the first ever SUP Ball games in Sardinia. 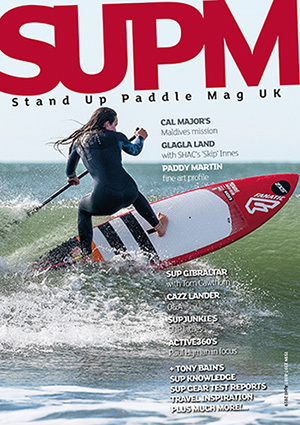 We pulled together a group of 18 from the UK, all keen to be part of the first large British group to try SUP there. The participants ranged from complete beginners to experienced SUP paddlers, but they were all intent on enjoying the island for five days. As it was well outside the main holiday season we had the pick of local hotels and chose one called Paola, on a hillside about 5km from Carloforte, because of its panoramic sea views and reputation for good food and friendly service. It made for a perfect location and lived up to its reputation and high Trip Advisor rating. Conditions on the second trip were a little challenging with a strong, cold northerly wind across Europe for most of the trip. This tested the experience and local knowledge of Mario and Diana to the full. 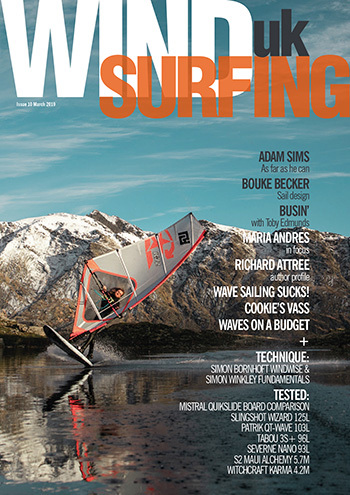 They passed this test with flying colours and knew exactly where the best conditions would be. The only regret for them was that the north of the island – the most exciting and dramatic coastline – was out of bounds throughout the trip with huge swells crashing against the cliffs and caves. At this time the whole of Europe was affected by strong winds from Siberia, which lowered air temperatures to well below the average for Easter. Meanwhile the south and most of the east and west coasts of San Pietro were sheltered, with light winds inshore. Most days were at least partially sunny and temperatures were quite similar to early summer at home. We were never cold when paddling – although getting changed was sometimes a bit chilly. Food is always good in Sardinia and in the island’s only town, Carloforte, there are plenty of excellent cafes and restaurants. Good wine and coffee is available everywhere and if you like seafood you will be in heaven with so much on offer. Everything from sea urchin pasta (made from the eggs of female urchins) to lobster is readily available and inexpensive. We tried a range of activities during the trip to see how each worked on the island. 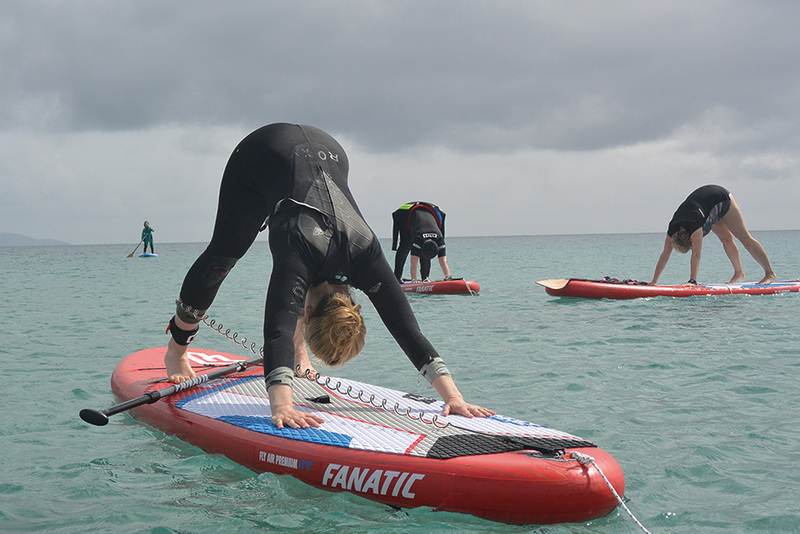 This included SUP Yoga on land and sea with Jen from PureYogaZone. For this, Mario had made some anchor bags from tuna fishing nets. These just needed filling with rocks and worked really well. A major purpose of the first trip was to see how San Pietro worked for early and late season trips (April-May and October-November) for beginner to intermediate SUP paddlers. The island passed this test well and we are already planning the next series of trips there. The variety of paddling available, beautiful coastline and great food all worked for the first group. Off the water, the island is also very good for walking and cycling (there are plenty of steep hills but you can rent electric bikes). It’s known for its large colony of Elonora’s Falcons and also for flamingos. Carloforte is a scenic and colourful town with steep, narrow streets leading up to its 18th century defensive walls. After the trip I stayed on for a week travelling around Sardinia – without SUPs. In April the island is extraordinarily scenic with a nice variety of terrain. High snow capped mountains towards the east coast and a high central plateau of rolling hills. On the coast there are unspoiled beaches everywhere, often with high mountain backdrops. I can’t wait to get back out there with a board.